Digestive biscuits are one of our most popular commercially-baked biscuit varieties . YES , I'm talking about making the very famous crummy yummy Home Made Digestive biscuits. 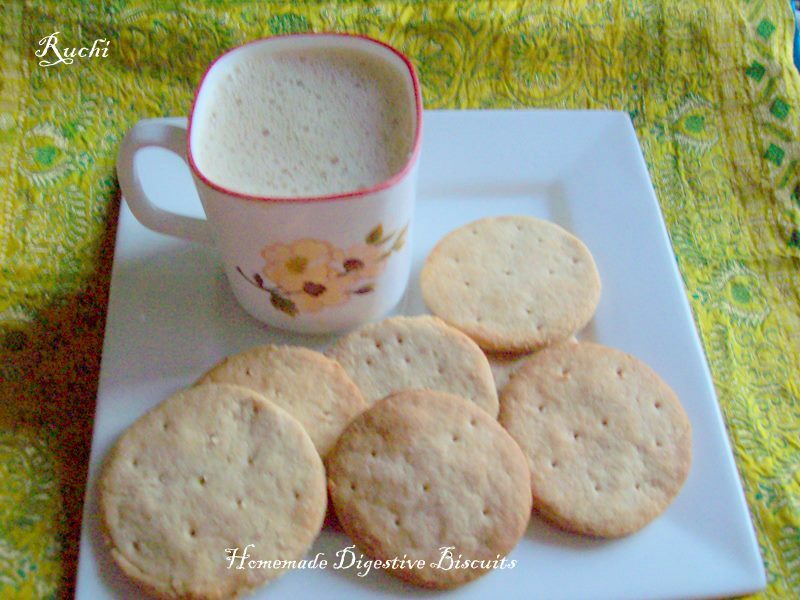 It is a biscuit with a crumbly texture and a simple flavor which some people find quite appealing.While surfing net for baking cookies i got this recipe I inspired by this easy recipe and made it yesterday.I found digestive Biscuit here. I made few changes I didn’t add all purpose flour and wheat germ. I made it with wheat flour. instead of oil I use butter. Somehow I feel sweet is not enough so I add few more sugar the result was Fantastic and which turned out delicious! 1.Place oats in a mixer and grind until powdery texture is obtained. 3.Then add the butter and mix until crumbly. 4.Add the milk and mix dough so it is no longer crumbly but a bit more firm. 5. Form a ball and place in fridge for 15 minutes. 6.Then take out dough, spread out to 3mm thickness and cut out 6cm diameter circles. 7.Cut to the required size using a round cutter and place onto a greased baking sheet . 8.Preheat oven to 180Cand Bake for 15 minutes, take out and let cool and store in an airtight container at room temperature. good one..will try making them soon.. Perfect guilt free tea time snack! Soo prefect looking biscuits,looks great Akka..